Property Location With a stay at Norfolk Waterside Marriott, you&apos;ll be centrally located in Norfolk, steps from Waterside Festival Marketplace and minutes from Town Point Park. 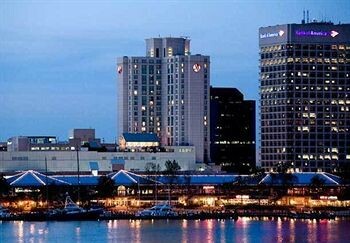 This hotel is within close proximity of USS Wisconsin BB-64 and Nauticus National Maritime Center.Rooms Make yourself at home in one of the 405 air-conditioned guestrooms. Your pillowtop bed comes with down comforters. Cable programming provides entertainment, and wired and wireless Internet access is available for a surcharge. Bathrooms have complimentary toiletries and hair dryers.Rec, Spa, Premium Amenities Dip into one of the 3 spa tubs or enjoy other recreational amenities, which include a health club. Additional amenities include complimentary wireless Internet access, concierge services, and babysitting/childcare.Dining Quench your thirst with your favorite drink at a bar/lounge. Buffet breakfasts are available for a fee.Business, Other Amenities Featured amenities include high-speed (wired) Internet access (surcharge), a 24-hour business center, and express check-in. Planning an event in Norfolk? This hotel has facilities measuring 60000 square feet (5574 square meters), including conference space. Self parking (subject to charges) is available onsite.